It’s been a year since the hype of Manny Pacquiao and Oscar Dela Hoya fight. Everyone was talking about it. Everyone was worried on how the fight would turn out. It was definitely the talk of the town. One saturday, I was watching Eat Bulaga, and saw this EB babe, Ann, doing her thing on one of the portions of the noontime show. The EB hosts used to call her “hopia” because of her “mali-mali” characteristic [she has the tendency to get easily surprised/shocked]. Then, Joey De Leon, the master of creativity and witty remarks, suddenly blurted out the name “Oscar Dela Hopia” for EB Babe Ann. And I find it very funny, and I thought, ‘hey, that’s a nice codename’. In case you didn’t know, I’ve been an active rusher since 2007, and I’ve been using the codename “Jun13” for my entries, requests, and greets. The codename is a lil lame but it has its own significance to me, putting together my nickname and my birthday/fave number. But I thought, “Oscar Dela Hopia” would be perfect for me too, since my real name is Oscar, and I’ve been very addicted to hopia that time (well, until now). So December 8, 2008, I tried joining the top10 using that new codename, and it was a hit! (well I do believe it was). My co-rushers loved it and found it really catchy. I also used that name on the other shows of RX and the DJs also found it very funny. Success! And most of the times, I receive messages in facebook and twitter saying that they always hear my name on the radio and they found it very funny. Some do say that they’re a fan! Whoa. I never thought that this will happen to me. Too overwhelming. So this morning, I celebrated the anniversary of my codename. I texted C&D about it and they remembered it. I’m so amused because Chico still remembered my old codename. That was really cute! So now, I’m very thankful to Mr. Joey De Leon. I’m very thankful that I made that decision to change my codename. I’m very thankful that I have the capacity to make people happy. 10.03.09 ~ Tanjoubi Omedetou Gozaimasu!! Anyways, this birthday post is inspired by my Acer’s (my co-Rusher) birthday post. CLICK HERE. In his post, he prepared a list of ang pinaka-list of bday greets. And I promised myself na I’ll do the same.. inggit ako eh hehe. This is just a recognition on the unique greetings that I received. Pinag-isipan, pinag-handaan ang pagbati. That’s nice, right? True enough, the love from my friends and strangers overflowed! Let’s get it on! Bea (rx radio1 via radio on-air) – Bedtime with Bea on RX93.1 That was last sunday, October 11. I told her kasi that it was my birthday on tuesday so she greeted me. yey! Alhmar (via forum) – from my co-rusher and co-LXP Acer “to one of the most active perverted rushers, enjoy your day. have a happy, happy, birthday! 😉“. Of all the greets I received, sa kanya ko lang nabasa yung word na “pervert” hahaha. It’s a tie between Raine and Pepperoni! The Ride: Jude & Gelli ~ Natouched ako sa sinabi ni Gelli.. “Happy birthday from your RX Family” and she said I’m part of RX na rin. awww! The Daily Survey: Louie & Christi ~ I enjoyed DS coz Christi read all the messages for me, and L&C guessed my age, and hey, they said I looked 21! Jumpstart: Gino & Fran ~ I was so happy kasi they played my twin spin request!! SashaPurse (co-rusher via on-air) – “Batiin nyo naman ng happy birthday yung favorite nyo, si oscar dela hopia!” ~ drama queen!!!!! Benjai (co-rusher via Blog) – [Oct 4, 2009 at 1:15 pm] – “cge.. ako naman bahala sa notebook.. dami pa sa office.. yung magsaysay pa!! ballpen gusto mo?? happy beerday (advance) pa-inom ka ha!! lasinging mo kami!! hik hik hik.. ay mali *nyif nyif nyif (*tawa ng angel) ^___^” ~ oh diba? hehe mwah benjai!! 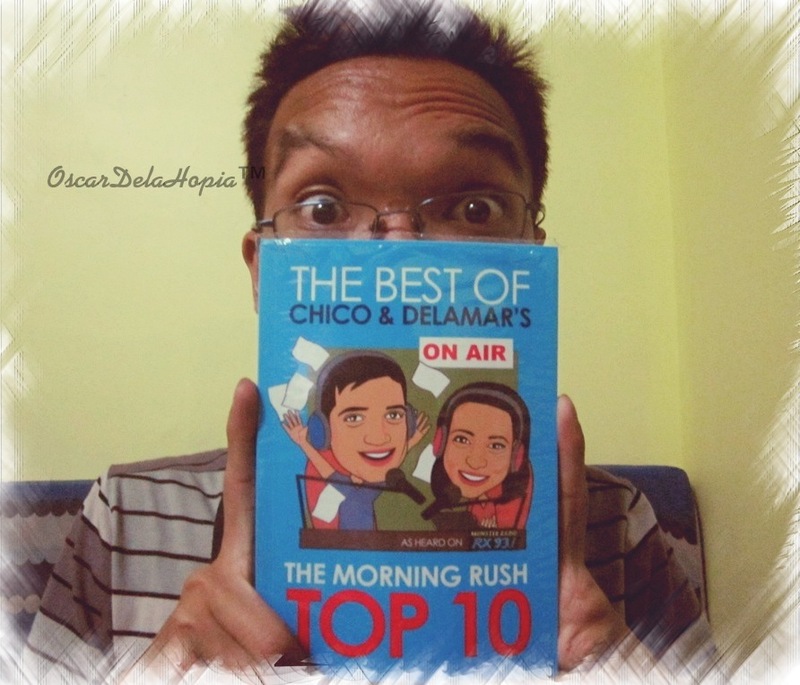 twittedsunshine (co-rusher Kim via twitter) – @OscarDelaHopia 祝你生日快樂! hApPy bOitdei osckie!!! take care! Badette (co-rusher babyburn via text) [06:56am] – “Weee! hapu beerday gOlden boy!!! wishing you a golden lovelyf heheh mwahugz! (para uminit naman xmas mo! enjoy ur day! )” ~ mainit na xmas daw oh! Bridgeport (Text) [07:05am] – “Good am! menu 1. Grilled Beef burger 2. Pork tapa wd fried lumpia togue 3. Breaded porkchop 4. 2 pcs Pork BBQ. Pls pass n make ur orders earlier. salamat” ~ akala ko kasama sa greetings. Hahahahaha. JoeSpecialist (bday card) _ Very touched ako sa only birthday gift na narecive ko. Very touching kasi yung message sa card ahehe. at may kasama pang Jason Mraz CDs! whoootwoot. :).. *natouch din ako sa text nya that goes: “Naexcite na din ako makita mo yung gift ko. A lil something for the years of friendship. Grabe, studyante ka pa lang nun!” awww.. yeah! memories! imagine, matagal na rin pala yun hehe. I’m so thankful! Thank You to all the people who greeted me. It really made my day! To my family, my HS Friends College Friends, Officemates, Rushers, G-Crew, Christinatix, RX Airstaffs, RX listeners (to those I personally know and those I haven’t met)… Thank You Very Much!! I feel so loved! yiheee. _pepperoni_ (twitter) @OscarDelaHopia The more you praise and celebrate your life, the more there is in life to celebrate.E~Oprah Winfrey ODH cumpleaños feliz!! Last Sunday, early morning, habang patapos na ang The Show, bigla na lang naghang si Benjoe (my PC, yep I baptized him, recently lang). Actually, normal thing na yun for me, kasi madalas syang mangyari when I’m using it… restart lang ang katapat nya. BUT, when I restarted it, nastuck na yung screen sa logo ng MSI. Waaaaah. So, I thought baka naover-use ko na talaga sya… so I just went back to slumber mode, hoping everything will be okay tomorrow. So ganun na nga… super sad… pano na ang forum, twitter, facebook, fancheck, messages ni God, daily horoscope, my good/bad status, mga pets ko sa FFS, ang paglevel ko sa Mafia, fortune cookies, quizzes about love, new songs sa SongOfTheWeek, at ang aking blog! Paano na??? Ok, enough with the drama. Anyways, share ko lang din dito. I was so bored in the office kanina, so I tried exploring the google (yun lang ang accessible na site sa office… at hanggang search ka lang, di mo mapapasok yung site mismo… pfft). I tried searching for “OscarDelaHopia”… wala lang… naisip ko lang. So lumabas yung twitter account ko and yung posts sa forum. Then, something caught my eyes. Meron palang multiply site na nakapangalan sa akin!! http://oscardelahopia.multiply.com !! what the!! So I asked my officemate to check it out, and meron nga! Wow! I’m not sure kung accident lang ba yun na naisip nya yung name na ganun, o isa syang impostor! Nakanaman!! Hahahaha! This is not the first time, actually. If you try searching for Oscar Dela Hopia in facebook, madaming lalabas na results. Haaay, is this a sign? LOL. Joke lang. Wow. Talk about longevity. This only proves that this amazing radio duo is still unbeatable and will forever be the best radio tandem in the whole universe!! 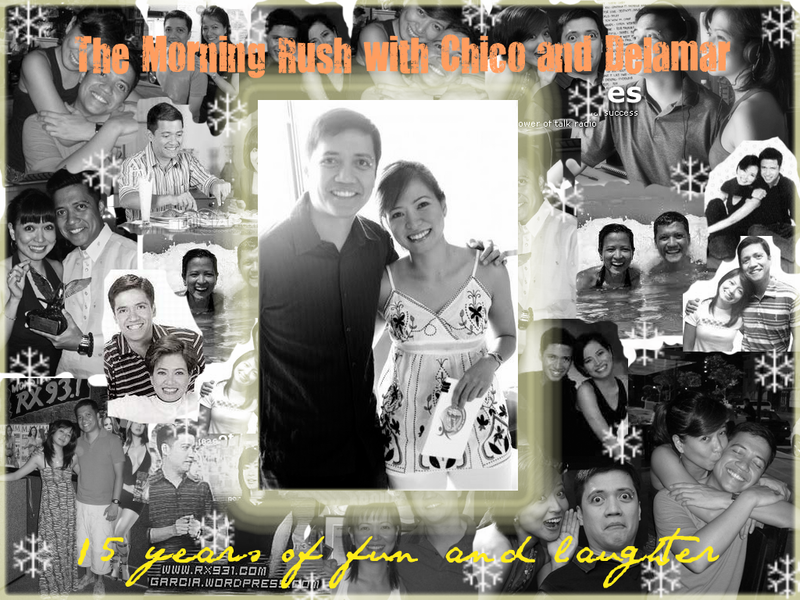 CHICO AND DELAMAR rockz!! I can still remember my very first post here in my blog. LINK. Sila agad yung una kong topic. I just really really love them! I can say that they really changed my lonely life (o’ drama).. I started listening to them nung 2002 (yata). Magthi-third year HS na ko nun. Summer nun, and bored na bored kami ng kuya ko that time. So we browse all the music stations and found them in KC FM. Medyo familiar na pala kami sa kanila kasi namention na sya samin nung tita namin before. So ayun.. we listened to them. Pero after few days, we found out na mawawala na daw yung TMR (that time).. sad. So I never heard from them for such a long time din. 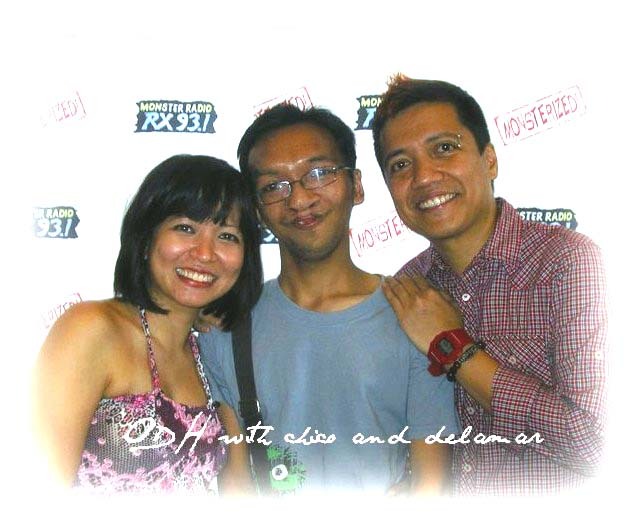 Until nagcollege na ako.. Summer ulit, and I found them again, sa RX 93.1 naman!! Happy ulit. Then sunod-sunod na yung nangyari.. I joined the forum of rushers and met a lot of cool people there. Then nung 4th year College na ko, I started joining the top 10 using my codename Jun13. Then nung October 2007, I finally met them! LINK. After that moment, mas naging active na ako. Sa top 10, sa greetings, and sa pagrerequest ng songs. I also started listening to the other shows in RX, especially Jumpstart and Countdown top7. Then I became more active in the forum of the rushers. Then ayun nga, I started joining the top 10 more often. I even blogged about my first time to land in the top spot of the top 10 LINK. I even started keeping a note of all my top entries that made it to the top 10. Check out this page. And feeling ko mas nakilala yata ako when I changed my codename from Jun13 to OscarDelaHopia! Ayun na, tumatak na sa lahat ng mga rushers yung codename ko. Even the other RX jocks already know me. I’m so happy!! The Morning Rush totally changed my life that way. Thanks Chico and Delamar. Thanks Rushers. Thanks The Morning Rush! 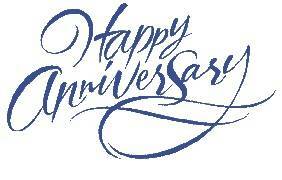 Happy 13th Anniversary!!!! !